Here’s your chance to celebrate Ringo Starr's birthday with him in LA. omaze.com is giving you the chance to join Ringo at his birthday bash – and join his family and friends to sing happy birthday on stage – and all you have to do to go in the draw to win this amazing opportunity is donate to charity. The more you donate, the more chances you have to win. 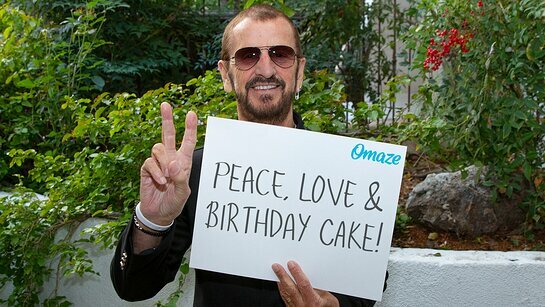 Every year, Ringo Starr has asked for one simple birthday wish: peace and love. To celebrate that wish, at noon your local time on July 7, people all around the world think, say or post, “peace and love.” But this year will be extra special, because you’re joining Ringo for the celebration in person! You and a friend will head to LA for Ringo’s epic birthday bash, where you’ll take in this awesome moment — on stage — with Ringo, his family and his celebrity friends. From sharing peace and love (and some cake! 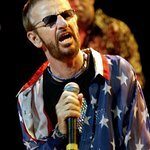 ), to singing Happy Birthday to Ringo while millions tune in from around the world, you’re in for a day you’ll never forget. Proceeds from this draw go to the David Lynch Foundation. The David Lynch Foundation (DLF) targets the epidemic of trauma and toxic stress among under-resourced populations through the implementation of the evidence-based Transcendental Meditation technique. DLF has served more than 500,000 children and adults worldwide, with a focus on urban youth in underserved schools, veterans suffering from post-traumatic stress and their families, and women and children who are survivors of domestic violence and sexual assault. DLF also works with the homeless, prison populations, people living with HIV/AIDS and others. To find out more about the draw and make a donation, click here.